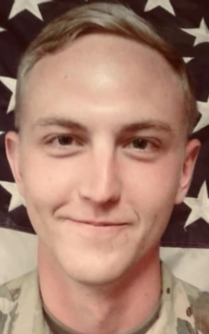 23, of Morehead City, North Carolina, died Oct. 4 of from wounds sustained from an improvised explosive device in Helmand province, Afghanistan. Slape was assigned to the 430th Explosive Ordnance Company, 60th Troop Command, of the North Carolina Army National Guard. He was posthumously promoted to the rank of sergeant. The Defense Department on Friday released the name of the soldier who was killed this week in Afghanistan. Sgt. James Slape, 23, died Thursday in Helmand province from wounds sustained from an improvised explosive device. He was deployed in support of Operations Resolute Support and Freedom’s Sentinel. Slape, of Morehead City, North Carolina, was assigned to the 430th Explosive Ordnance Company, 60th Troop Command, of the North Carolina Army National Guard. He was posthumously promoted to the rank of sergeant. Slape’s unit deployed to Afghanistan in April and is scheduled to return to the U.S. in the spring. Slape joined the North Carolina Guard in 2013 and, after training, graduated as an explosive ordnance specialist in 2015.